To utilize the built-in banner area for display of your images, please follow the instructions below. 1. Click and drag your image into the Resources area of the project file (banner images used on the preview site measured 1200px x 700px. Images with small dimensions may not display properly due to the size of the banner area on larger viewing devices). The Resources area can be found on the left hand column of RapidWeaver just below your webpages. (Please note that the Resources area is limited to RapidWeaver 5 and above). 3. Replace the "my-image" with the name of the image. (Please ensure that the name of your image is all lowercase and does not contain any spaces, characters, or symbols. Failure to do so may prevent the image from displaying upon publishing your site). To utilize the built-in responsive slideshow for any page, please follow the instructions below. 1. Click and drag your images into the Resources area of the project file. The Resources area can be found on the left hand column of RapidWeaver just below your webpages. For proper display, please ensure slideshow images have a width of at least 960px. The height does not require a set measurement, however the height of the actual image will determine the height of the slideshow. All slideshow images should share the same dimensions for proper display). (Please ensure that the name of your image is all lowercase and does not contain any spaces, characters, or symbols. Failure to do so may prevent the image from displaying upon publishing your site). 3. Replace the word my-image within the code to the name of the image you would like to have as the first image for your slideshow. You have now just completed your slideshow with 1 image. The code below shows the additional line of code should be placed after the first li sequence, and what your sidebar area should look for a slideshow with two images. You may continue to add images to your slideshow as needed. Please note that images will appear in corresponding order. 5. Highlight the entire code in the sidebar area and click Clear Formatting, then Ignore Formatting under Format at the top left of your screen. If this is done correctly, the entire code will have a pink highlight. 6. Check the Display On under Built-In-Slideshow in the Styles section of RapidWeaver. (There is also an option to choose between a slideshow that will transition images with a fade-in, fade-out feature, or slider effect under Slideshow Transition in the Style Options section. Third-party slideshows should be placed in an Extra Content #1 Stack, and the toggle option 3rd Party Slideshow should be selected). To utilize the option of displaying a background image of your choosing for either the main content area, or the 5 Extra Content Areas, please follow the instructions below. 1. Click and drag your image into the Resources area of the project file. (Please ensure that your images are large, high quality images. Smaller images will not display clear or crisp). The Resources area can be found on the left hand column of RapidWeaver just below your webpages. (Please note that the Resources area is limited to RapidWeaver 5 and above). 3. Replace the "my-image" with the name of the image AND if utilizing the Extra Content Area, replace the ? with the appropriate Extra Content numbered area. ONLY Extra Content Areas 2-6 are useable options for this feature. (Please ensure that the name of your image is all lowercase and does not contain any spaces, characters, or symbols. Failure to do so may prevent the image from displaying upon publishing your site). 4. If utilizing an extra content area, you must select the corresponding extra content area in the Toggle category to display the area. Please note that content background images may switch from a switched position to one that scrolls on tablet and handheld devices. This has nothing to do with the theme and everything to do with the functionality and limitations of those devices. Internet Explorer 8 also has limitation with processing background images. As a result, when viewed in Internet Explorer 8, background images will convert to the solid color selected for the corresponding background area. Endeavor contains many Extra Content Areas to expand your design choices and options. The Extra Content Areas are limited to using the Extra Content Stack with Stacks 2 and therefore can only be used on pages built using Stacks 2 with the exception of Extra Content areas 8 and 9. You can download the Extra Content stack for free under Extra Content Stacks Plugin at the following link: http://extracontent.org. When using the Extra Content stack, it is important to target the content within the stack if using margin or padding. Margin and padding should not be applied to the actual Extra Content stack that contains the content. Please note that the Extra Content Areas begin with Extra Content #2 and end in Extra Content #6. Do not use any other Extra Content Areas as they are being utilized for other functions related to the theme with the exception of Extra Content areas 8 and 9. The Built-In Style options of theme include the ability to utilize your own custom background image or any solid color. The EXTRA CONTENT #8 area is located above the main content and is used for a main content header area for those pages that may be limited with having a dedicated header area (i.e. Blog and Contact pages). You can certainly use Extra Content #8 in other pages as well, as this page is utilizing this feature with the word TUTORIAL. To utilize this built-in extra content area, please use the following instructions for proper implementation. 1. Place the following code in a stacks container or the content area of the page. (For the Blog page the code can be placed in any blog entry. For the Contact page the code can be placed in the customizable text area of the the page). 2. Simply replace Sample Content with your own content. 3. Highlight the entire code and click Clear Formatting, then Ignore Formatting under Format at the top left of your screen. The code will have a pink background if successful. 4. Under the Toggle Style Option, select Extra Content #8 and your content will display. The EXTRA CONTENT #9 area is located directly in the banner area as displayed throughout the preview site. This area has replaced the RapidWeaver Slogan option for this theme. This was done so that users could choose between displaying the same content within the banner area throughout a site, or not display any content in the area, or display a different caption on any page as shown in this preview site. To utilize the built-in extra content area displayed in the banner area, please use the following instructions for proper implementation. 1. Place the following code in a stacks container or the content area of the page. 2. Simply replace Sample Content with your own content. Please note that Extra Content #9 was designed to display a minimal amount of content and display issues will arise if the content area is used for an excessive amount of content. 4. Under the Toggle Style Option, select Extra Content #9 and your content will display. Endeavor has the capacity to accommodate a logo and will display it to the left of the site title. If the site title is not utilized, the logo will display where the title is placed. There are no set width or height requirements for the logo, however, smaller logos are ideally suited for this theme. Logos significantly larger in height than the title text and logos with a wide width may have display issues. The design of Endeavor has the logo, title, and navigation share the same linear space. As a result, the number of navigation links that will display properly is completely dependent upon a combination of the length of a logo, and title. Once you have embedded your video from any of the compatible media sites listed above, highlight the code used for embedding and click on "Ignore Formatting" under Format. Your video is now set-up and ready to display appropriately on multiple devices. (Please note that embedded video is not the actual link to the video but a string of generated code. Please ensure that the embed code includes http in the web address portion). Endeavor is a responsive theme. As a result, it is imperative to ensure that any stacks used with Stacks 2, or any 3rd party products are responsive as well. While it is not necessary to build a website with Endeavor using Stacks 2, it is a wonderful product that offers additional options to building your site, including hundreds of third party-products. If you choose to use Stacks 2, please ensure the stacks you are using are responsive. Joe Workman's responsive layout stack is a great place to start your collection of responsive stacks and can be found at the following link: http://joeworkman.net/rapidweaver/stacks/responsive-layout/. The fluid image stack from this package was used for the images on the main page of this preview site. If you are experiencing any display issues with the theme, or if certain style options are not working properly, please disable the RapidWeaver Consolidate CSS File setting within Preferences. The disabling of this setting should restore your style option selections and resolve display issues. 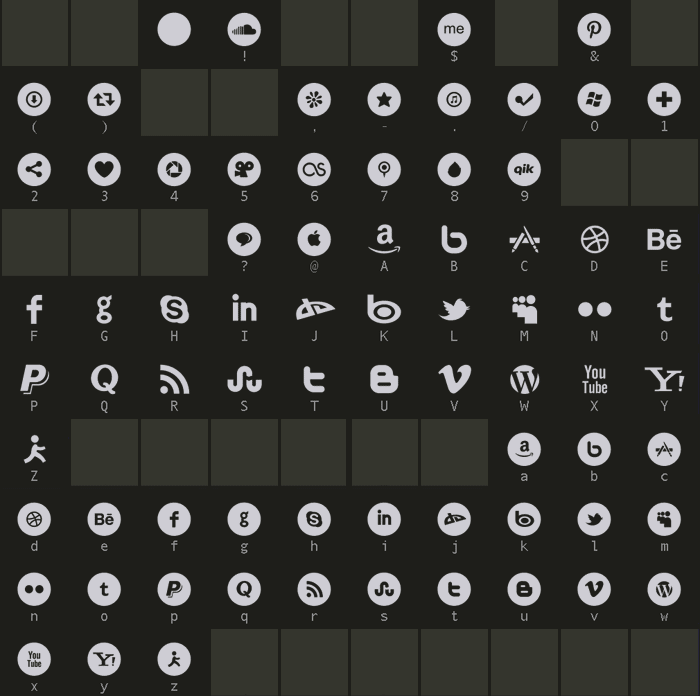 Endeavor has included 2 separate icon sets to ensure the social icon needed for your site is not left out. To utilize the first set of built-in social icons, please follow the instructions below. 2. Replace the # with the page URL of your social icon. 3. Replace the letter f with the corresponding symbol of the social icon of your choice using the chart below. 4. Highlight the entire code and click Clear Formatting, then Ignore Formatting under Format at the top left of your screen. To utilize the second set of built-in social icons, please follow the instructions below. (For multiple social icons, repeat the above steps for each desired icon. Please note that for now, regardless of the order of icons, the first set will always display before the second set of icons).